Julian Demond, captain of industry, has left behind everything to begin a walkabout — he believes he’s on a mission from God. While in the wasteland, he comes across a figure unlike any other, who calls himself Wick…and claims to be God. Their journey will span the globe, as neither man merely wants to make a mark on the world, but a scar. Created by Clive Barker as original comic book concept and co-written by Barker with HELLRAISER writing partner Mark Miller, CLIVE BARKER’S NEXT TESTAMENT marks the first time the master of horror has created and written an original comic book series. 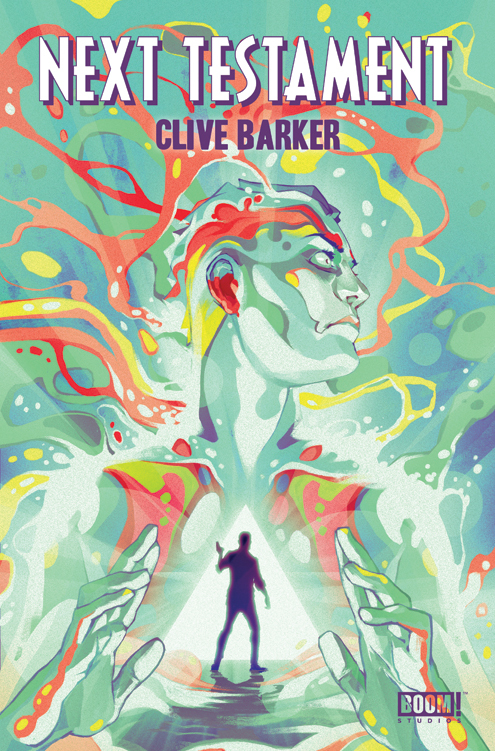 CLIVE BARKER’S NEXT TESTAMENT #1 will arrive in stores on May 29th with a cover by illustrator Goni Montes and carry a retail price of $3.99 under Diamond order code MAR130920. The premier issue will also feature a retailer incentive cover by Ben Oliver (BATWING) and an ultra-rare incentive cover painted and signed by Clive Barker himself! Founded by Ross Richie in 2005, Diamond Gem Award-winning “Best Publisher” BOOM! Studios (boom-studios.com) generates a constellation of best-selling Eisner and Harvey Award-winning original and licensed comic books and graphic novels with the industry’s top talent. BOOM! Studios is the home of Mike Carey’s SUICIDE RISK, Clive Barker’s NEXT TESTAMENT and HELLRAISER, Paul Jenkins and Humberto Ramos’ FAIRY QUEST, PLANET OF THE APES, Max Bemis’ POLARITY and Mark Waid’s IRREDEEMABLE. Steven Grant’s graphic novel 2 GUNS will be released as a feature film from Universal Pictures August 2nd, starring Denzel Washington and Mark Wahlberg. BOOM!’s all-ages imprint KaBOOM! publishes Charles Schulz’ PEANUTS, Jim Davis’ GARFIELD, Cartoon Network’s ADVENTURE TIME and REGULAR SHOW, Mike Kunkel’s HEROBEAR AND THE KID and Roger Langridge’s Eisner Award-winning SNARKED.